While flying is something that creatures other than people have been doing for millions of years, we’ve only been actively exploring this realm for around 200 years and flying heavier than air machines for just over a century. But just as we know how gravity behaves and how to make good use of it, the same is true for that thing that allows us to fly, which we refer to as lift. We know what it does but have been working hard all this time to understand how it does it. The two physicists whose names are conjured most often in the defense of one theory or another are Sir Isaac Newton (1642-1727), the legendary English scientist who described the behavior of solid materials in great detail, and Daniel Bernoulli (1700-1782), the Swiss-born mathematician who was a pioneer in the science of fluids. Longer Path, Slower Transit Time: This theory states that the air flowing over the top of the wing takes longer to make its journey from the leading edge to the trailing edge, accelerating to keep up with the air on the lower surface, thus causing lower pressure, essentially sucking the wing upwards. Why it’s wrong: The math doesn’t work. The air going over the top of the wing doesn’t meet at the end…it gets there much sooner. Deflection: Air molecules hit the bottom of the wing, pushing it upward. Voila, lift! 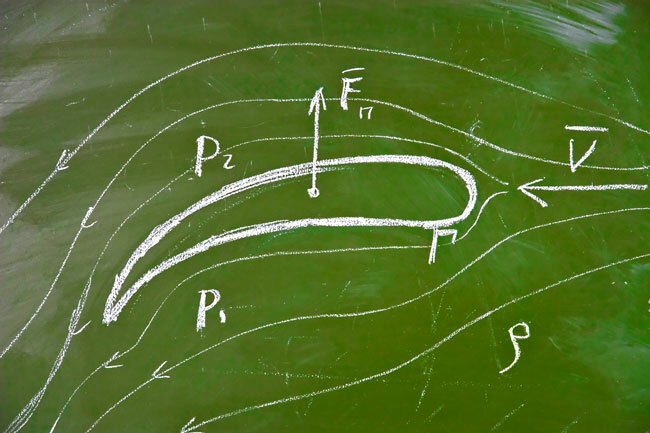 Why it’s wrong: Again, our observations of airfoils at work don’t support the model. In actuality, both the top and bottom airfoils are strongly affected by the fluid, not just the lower airfoil. Venturi Model: Related to theory number 1, the venturi theory envisions the wing as a tube-like structure that forces the air to accelerate (as happens in a carburetor) and therefore create lower pressure above, generating lift. Why it’s wrong: Wings don’t work like venturis, which are tubes. There is no enclosing surface in play. According to physicists, the generation of lift is the result of the combination of the behavior of fluids and solids in order to account for the changes to mass, momentum and energy in the system. In essence, the truth of how lift is created is a blending of Newton’s and Bernoulli’s laws, taking into account both how the solid (the wing) behaves in the fluid (the air) and how the air itself behaves. You guys have got it all wrong. The thing that makes airplanes fly is money. The more money you spend, the higher and faster you can go.